The Voice of the Philippines completes list of Top 8 artists today, September 15, 2013 in the Fourth Live Shows (results) of the no. 1 singing reality show in the Philippines. 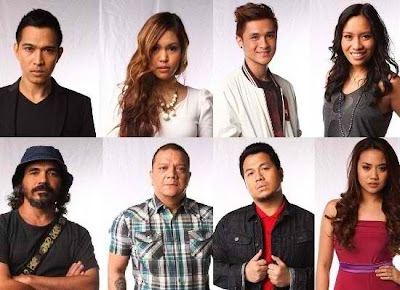 Janice Javier, Klarisse de Guzman, Myk Perez and Radha entered the Final 8 and will join the first four in the circle - Thor Dulay, Morissette Amon, Paolo Onesa, and Mitoy. Janice (Team Apl), Klarisse (Team Sarah), Myk (Team Bamboo) and Radha (Team Lea) got 104.88, 123.91, 121.13 and 145.50 total points respectively from the judges and public votes. Voice Journey for Jessica Reynoso, Eva delos Santos, Isabella Fabregas and Kimpoy Mainit ended tonight. Competition became intense between Janice Javier (“Chain of Fools”) and student Jessica Reynoso (“Ikaw”) for Team Apl, and music student Klarisse de Guzman (“I Can’t Make You Love Me”) and entrepreneur Eva delos Santos (“Ikaw Lang Ang Mamahalin”) for Team Sarah. For Kamp Kawayan or Team Bamboo are marketing assistant Isabella Fabregas and freelance singer Myk Perez (“Chasing Pavements”), and for Team Lea, student Kimpoy Mainit (“Weak”) did a head to head with singer-songwriter Radha (“Time After Time”). On the third and fourth live shows, the public and the coaches will have equal share of power on which artist would advance to the final eight. In the finale episode, each team will only be represented by one artist and the winner of the competition will only be decided by the public votes. In the last week live shows (September 8, 2013), Morissette Amon (Team Sarah), Mitoy Yonting (Team Lea), Paolo Onesa (Team Bamboo) and Thor (Team Apl) are Safe and entered Top 8 circle for having 110.41, 104.11, 141.24 and 119.72 total points respectively from the coach and public votes. Meanwhile, Maki Ricafort (Team Sarah), Darryl Shy (Team Lea), Lee Grane Maranan (Team Bamboo) and Penelope Matanguihan (Team Apl) were eliminated on the competition. Don’t miss “The Voice of the Philippines,” every Saturday, 9 PM, and every Sunday, 8:15 PM on ABS-CBN.